Painting from Jericoaquara Beach in Brazil, Dayse Diaz creates a composition full of beauty and tranquility. 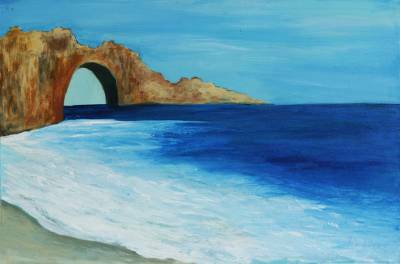 Jutting out into the deep blue waters of the ocean, a large rock forms an archway that frames the sky. Diaz paints this scene in an impressionist style. Titled Praia de Jericoaquara in Portuguese.